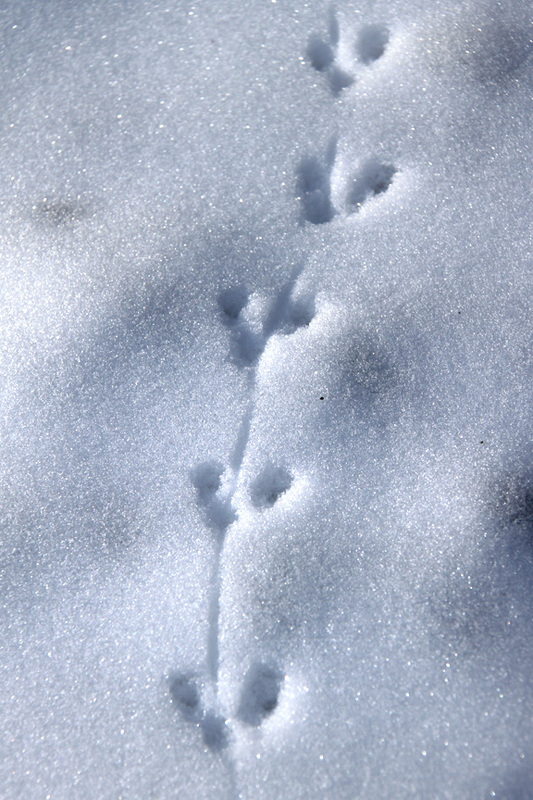 As temperatures begin to moderate and animal activity picks up, now is probably the best time to get out and search for, identify and interpret animal tracks and signs in the snow or mud. Even a trip to the dumpster can turn a class into a CSI unit piecing together clues of events that may have occurred only hours before. 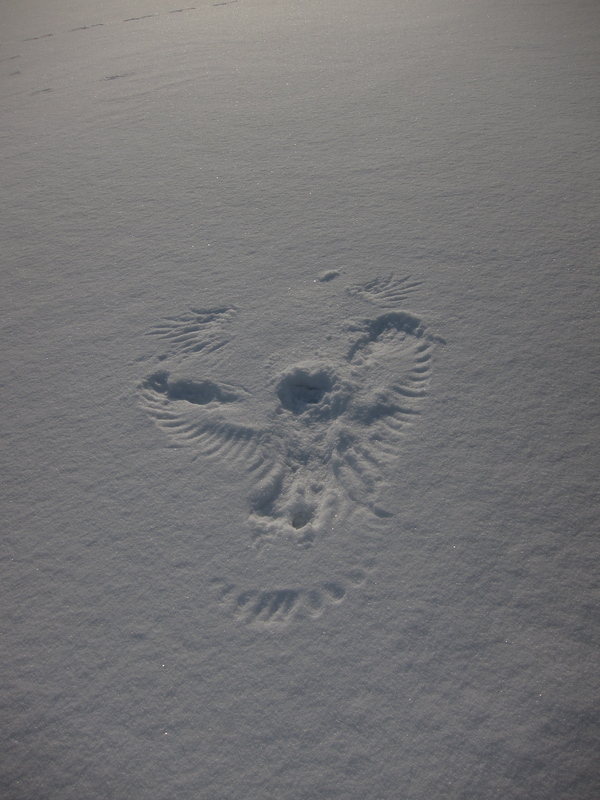 Did the early bird get the worm, or was it nailed by a cat, or perhaps a hawk or an owl? 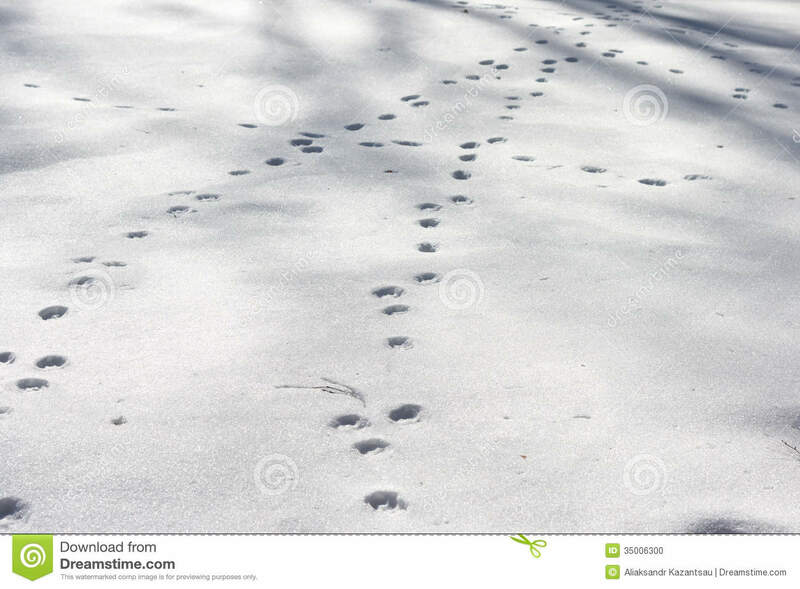 Here’s a good guide for kids to tracks and signs, including a simple key, and here are some photos of common animal tracks. A good place to start is with our good friend, the squirrel. 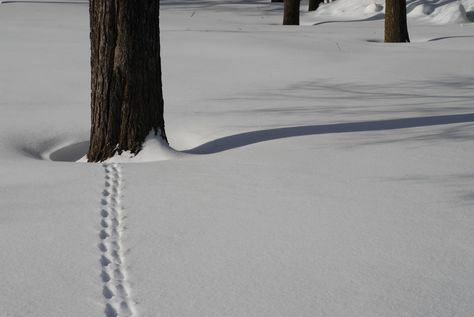 As you might expect, squirrels leave veritable highways that generally run from tree to tree. 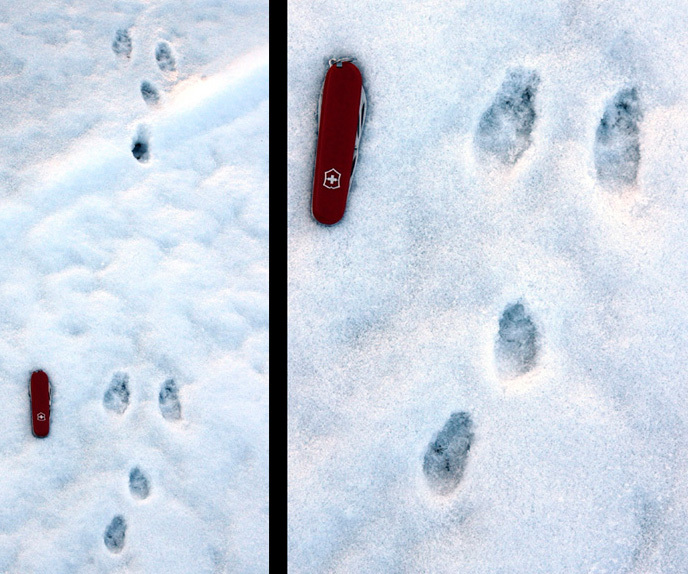 That’s one of the best ways of telling them from Eastern Cottontail Rabbit and Snowshoe Hare prints, which are quite similar, but tend not to go from tree to tree. All three animals gallop, which means that they move both front feet together, and then both back feet, often landing with the back feet in front of the front feet, as in the rabbit track above. 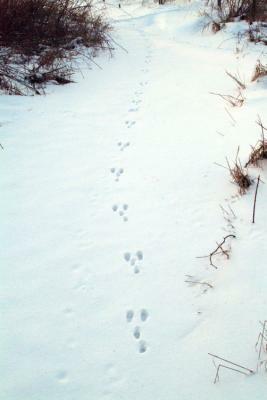 The rabbit’s back feet are somewhat larger, but the best way to tell isolated prints apart is that the rabbit and hare almost always lands with front paws in line with the direction of travel (one before the other), while the squirrel never does — they are essentially side by side. 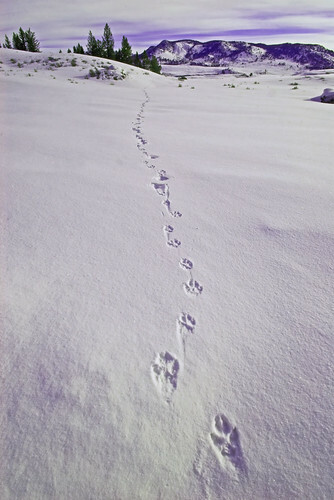 Deer Mice also gallop, while voles walk or trot along often under the snow. These tunnels get exposed as the snow melts. Dogs, coyotes and wolves can be hard to tell apart, but behaviour plays a role. Coyotes and wolves almost always register. 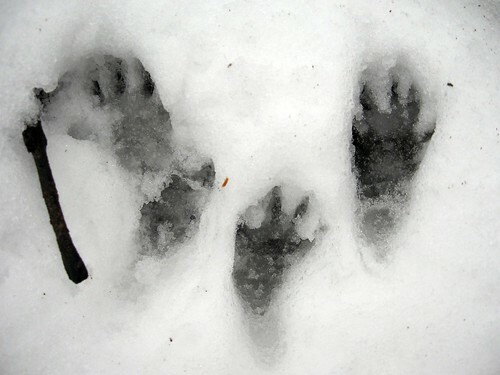 That is, the rear paw is placed exactly in the print left by the front paw (saves energy), leaving a single line of tracks. 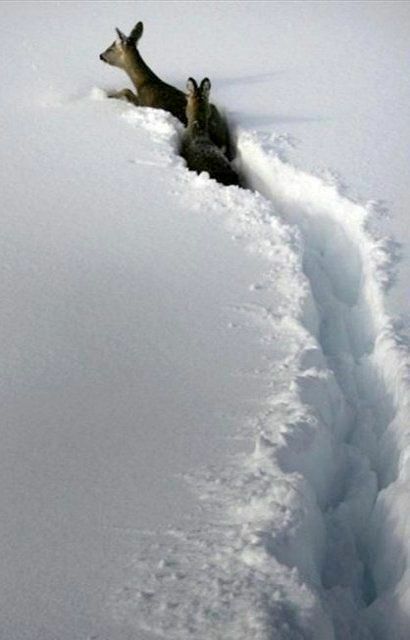 Dogs often miss, leaving a double track here and there. Also, unless following a scent, coyotes and wolves want to get from here to there with the least amount of energy, which is a straight line. Dogs, knowing that the next meal will be there, will tend to wander all over the place. 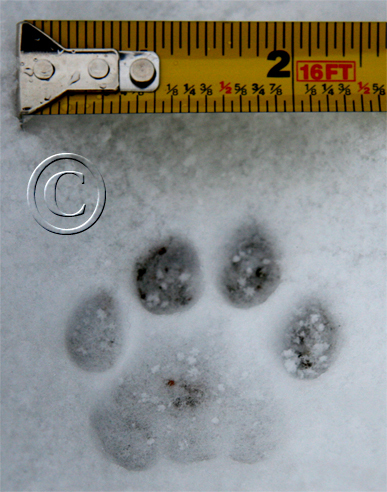 Members of the dog family tend to have oval prints that show claw marks, while cat family prints are more round, and don’t show claws. 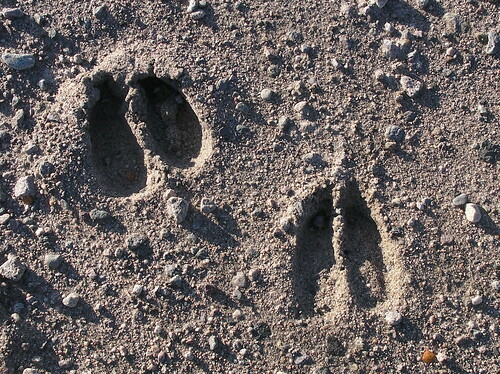 Deer may or may not register, and tend to drag their feet like teenagers. 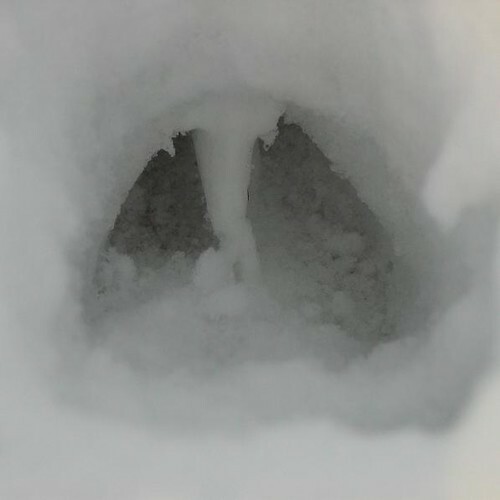 The prints are heart-shaped, with the deer traveling in the direction of the point. 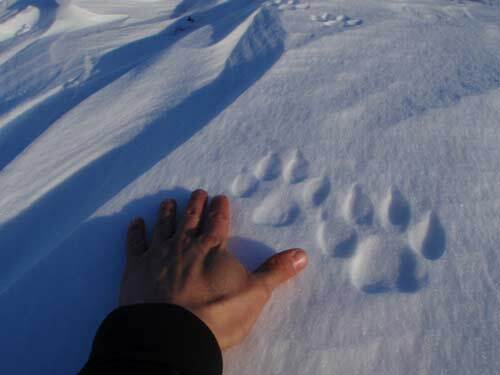 In soft snow or mud, or if the animal is moving quickly, the track may splay out, and dew claw marks seen at the rear of the track. 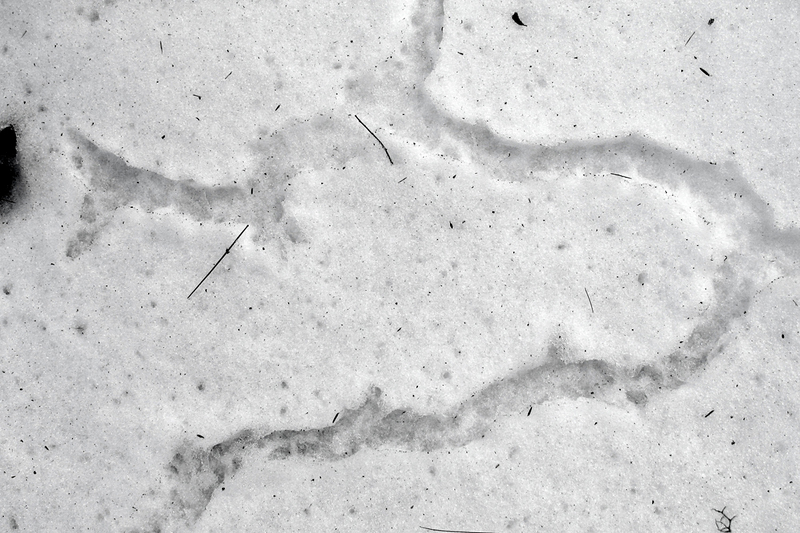 Moose tracks are larger, more oval, and moose pick up their feet more. Of course, in this kind of snow, no one picks up their feet! 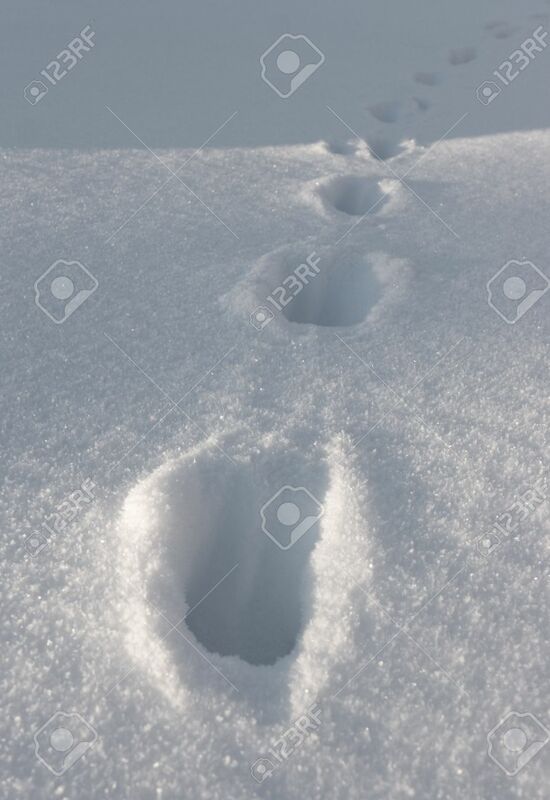 Note also that as the snow melts, tracks will enlarge and look bigger. But the most fun is piecing together the action. Whether it’s obvious, or not quite so obvious, you can picture in your mind’s eye what we almost never get to see. Here is a CSI: Critter Scene Investigation lesson to try out. It was a mixed bag of groundhog predictions this year, with both Ontario’s Wiarton Willie, Alberta’s Balzac Billy and the US's Punxsutawney Phil on the early spring side. However, Nova Scotia’s Shubenacadie Sam, Quebec’s Fred la marmotte and Nova Scotia’s Lucy the Lobster (?) are calling for a late arrival. Let’s see what happens. How accurate are these furry prognosticators? Phil is the continent’s longest-running predictor, and his success rate can be found here. Overall, the furry critters are right about 37% of the time. Monarch butterfly newsletters have begun on the Journey North website, and will continue throughout the spring migration. Tune in and prepare for the journey north beginning in March. Consider joining so that you can report your sightings. Other species you can track and report on include the American Robin and two hummingbirds, including our Ruby-throated. The Monarch population in Mexico is up 144% over last year! This growth was apparently fuelled by excellent weather in 2018, and cannot be taken as a trend. Still, it is the largest Mexican population since 06/07. Valentine’s Day is upon us, and all thoughts turn to …bird songs. Love is in the air, and on mild, sunny mornings you will hear more and more birds as pair bonds are established or renewed. The “Hi, Sweetie!” (play typical song) of the Black-capped Chickadee is joined by the enthusiastic calls of White- and Red-breasted Nuthatches, Mourning Doves, Northern Cardinals, House Finches and Purple Finches, to mention a few (songs and/or calls are available on all of these sites). Continuing with the mating theme, woodpeckers drum to mark their territory, and Common Goldeneye court each other (video) on open water. Also watch for Red-tailed Hawks soaring together in wide circles. Horned Larks are one of the first birds to return from the south, and can be found hanging out with Snow Buntings along roadsides and on fields. They will sing in flight. Snowy Owls have been occasional this winter in Atlantic Canada and fairly common along the St. Lawrence River and across southwestern and southcentral Ontario (with a fair concentration on Amherst and Wolfe Islands), and across the southern prairies. Northern Hawk Owls have mostly been reported from Manitoba and further west. These owls are boreal residents that occasionally venture south. Diurnal habits and tameness can result in good views. And the looks of this owl are a bit different than most owls. As their name suggests, they have a hawk-like body with short wings and a long tail. Great Gray Owls are quite uncommon as well. Don’t forget to get out and count some birds during the Great Backyard Bird Count occurring February 14th-17th. Here are some bird activities to get students excited. Male skunks are starting to look for mates. A whiff of skunk on a damp winter’s night is one of the first smells of spring – one spray can be smelled over 6 square kilometres, and contains chemicals used to make WW I mustard gas! Burbot, a freshwater member of the cod family, are mating under the ice (starts at 1:00), moving across the bottom in a writhing mass of about a dozen fish. Fertilized eggs are left behind to fend for themselves. The increase in daylight is very noticeable now. We’ve gained more than an hour since Winter Solstice. Shadows are getting shorter, and the sun’s just a bit closer. More importantly, it has to cut through less atmosphere, and it’s rays are spread over less area. So you will see snow melting on sunny days, even in below-zero temperatures. Don’t forget about the moon and Mars on the 10th, while Venus and Saturn join up the morning of the 18th, followed by the year’s biggest full supermoon that evening, as the moon approaches its closest point to the earth. Of course, February 14th is Valentine’s Day, so here is a bit of an interspecies (and inter-generational) love story for you.